A typical "Red Menace" yarn, with Chinese villains instead of Russian ones. The idea may originally have come from the old von Sternberg-Dietrich exotica, Shanghai Express, since it's set on the same train but going in the opposite direction. 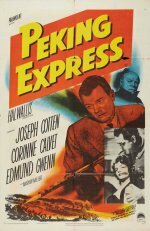 Aboard is UN doctor Joseph Cotten, who is going to perform an operation on an anti-communist leader; there's also Cotten's love interest, a priest and a communist apparatchik. The hefty doses of ideological dialogue make for a rather slow journey, but things liven up when bandits raid the train and take everyone hostage.